To look at her now, you wouldn’t guess her backstory. Ina Jani (EENA YANI) graduated from Weinberg College in June. Recently named an American Dream Fellow by the Merage Foundation, she has done groundbreaking research on cancer patients and looks forward to med school and a career in pediatric surgery. But while her Northwestern classmates may have learned about war from history books or newscasts, Ina experienced its terror firsthand. She credits Northwestern with giving her the inspiration to rise above her troubles and the tools to reach her goals. 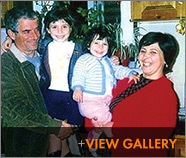 Ina spent her early childhood in Berat, in southern Albania, with her mother, father, and little sister. Her family was close, with roots in several cultures. Her father’s family spoke Greek; her mother’s, Romanian. Her parents’ arranged marriage, common in the Greek Orthodox tradition, grew into a love marriage and provided them the solidarity to endure what was to come. In 1997, when Ina was 10, crowds of people took to the streets in frustration, having just lost their life savings in government-approved Ponzi schemes. Helmeted police tried to stave off rock-throwing with their shields, then fired into the crowds. An all-out civil war ensued, and the southern half of Albania fell under the control of rebels and criminal gangs. Ina remembers, “My father’s bread factory was growing, but when the civil war started, a bunch of people came in and took everything but the building.” Loss of the business wasn’t the worst of it, as Berat became a very dangerous place to live and Ina grew up fast. “If you hear Kalashnikovs out of the window 24 hours a day, and if your parents have you sleep on the floor, away from the window so you don’t get shot, you understand what’s going on,” says Ina. A failed government, interrupted schooling, and frequent moves for safety to different cities—even to Greece—would seem to portend a rocky future. Fortunately for Ina, the story takes a far happier turn. Ina finished middle school in Durres, Albania, then moved to another city for boarding school, where her high school classes were taught in English, Albanian, and Turkish. Coming to the United States was the biggest dream of her life, says Ina. When a friend of hers was admitted to Stanford but couldn’t get a visa, that dream seemed unreachable. But she convinced her dad to apply for the American Green Card Lottery, and to their amazement, they won. A year and a half later, she came to the States. But her happy, productive life on the Evanston campus—filled with pre-med studies, new friends, and volunteer work—was interrupted in its second year. Back in Albania, her Dad had had two bouts with cancer, and, in 2007, was diagnosed with terminal pancreatic cancer. “It was a week before finals my sophomore year when I learned my father was going to die,” Ina recalls. That’s when her Northwestern professors came to her aid. Thomas Meade, the Eileen M. Foell Professor of Chemistry, was already a mentor who provided inspiration in class and advice about research, study abroad, and application to medical school. “When I went to Professor Meade about my Dad, he contacted some doctors for me and sent them the test results to make sure there wasn’t anything that could be done. He contacted a great pancreatic cancer surgeon and made the guy call me,” Ina says, still a bit incredulous that a teacher would go to such lengths. Both Meade and Vimla Band, the principal investigator in the lab in which Ina worked, gave her a hug and some of the best advice she ever received: take a year off, go back home to Albania, and comfort your father and family. “I’d have regretted it every single day of my life if I hadn’t done that,” she now says, since her Dad did pass away during that year. But her worries at the time included the money it would take to travel back and forth to protect her residency status and the holes in her academic record that might negate her medical school chances. She had to come up with a quick plan to make the time at home productive. “I thought about getting an undergraduate grant to do research in Albania and using the money to come back to the U.S. and not be a burden to my family,” she says. Her best idea for research? Truth-telling to cancer patients, since her father had not been told his diagnosis, and Ina had severe doubts about the fairness of that choice. She sought out Mark Sheldon, a Weinberg Distinguished Lecturer in Philosophy and an expert in bioethics. “I was so scared to ask him to be my project adviser because he knew nothing about me,” says Ina. “When I told him my story, he immediately agreed.” Sheldon’s mentoring proved invaluable; as Ina submitted the grant application, it was quickly approved, and she was on her way home. The chief finding of her thesis: cancer is a word that is never mentioned in a hospital setting in Albania, a difficult concept for Americans to grasp. Ina learned much from shadowing and surveying 48 doctors over a period of many months. If a patient is taking chemotherapy, for example, the drugs are referred to as “strong antibiotics.” And although some patients may understand the situation, the vast majority don’t ask their doctors for the truth. Ina is working with Professor Sheldon to polish the thesis and turn it into a paper worthy of publishing in a top medical journal. Sheldon cites Ina’s remarkable strength of character. “She showed great fortitude and courage by returning to Albania when her father was dying and engaging in the work that she did, interviewing physicians about an issue that was so professionally controversial and so deeply personal for her and her family,” he says. Ina has recently returned from India, where she taught English to children in an orphanage and volunteered in clinics in the rural areas around Madurai, south India. The experience was made possible by the Merage Foundation for the American Dream, which chooses immigrants like Ina based on exceptional academic record, leadership, consistent ethical behavior, and potential to make an important contribution to this country. Fellows receive a $20,000 stipend over two years. “This gave me the opportunity to immerse myself in a completely different culture, to learn about public health issues, and to teach children in orphanages some skills which might change their futures,” Ina says. She has returned to the States and is applying to medical school. Eventually she would like to become part of Doctors Without Borders, a group which figured prominently in her own life. When she was 10, she was in a freak accident, hit in the face by flying debris. In peacetime, the injury would not have posed a problem, but this was wartime. “The typical Albanian hospital didn’t have many supplies and people were dying because of lack of basic medication,” she explains. “When my dad’s friend got shot in the arm, it was easily treatable, but the hospital did not have the resources. After three months he died from gangrene.